Typeface, as one of the notable design factors in print advertising,can play a significant meaning-conveying role via its semanticassociation with other ad elements. Although the importance of typefaceis well established in design aspects, research looking into the impact oftypeface on audiences in the context of persuasive communication andadvertising is scarce. Therefore, this study investigates whether typefaceundermines or enhances the audience’s responses to advertising via itsassociation to other visual elements in the advertisement. The results fromthis study indicate that the suitability of typeface for a particular product,in conjunction with a congruent message, can generate positive responsesamong the advertising audience. By employing an experimental design anda visual communication perspective, this study advances our knowledgeabout typeface’s meaning-conveying role in advertising. Verbal messages, visuals, and the tone of verbal messages are the three major components of communication (Childer & Jass, 2002). Unlike verbal messages and visuals, components that can be delivered in their original form through various media, the tone of verbal messages can be delivered differently across media. With certain media, such as television or the Internet, tone of voice is indicated to the audience via an announcer or background music; in print media, however, the ‘tone’ and ‘voice’ of a message cannot be experienced as it was in its original format. Rather, it is represented by the “physical appearance of the written words” (Childer & Jass, 2002), since print media do not support sound-related elements. In visual-oriented communication such as print advertising, typeface is considered as an important executional cue; as such, it has great potential to increase advertising effectiveness (McCarthy & Mothersbaugh, 2002) via its perceived unity with other elements in advertising. Therefore, typeface that is appropriate for an advertising message helps audiences to comprehend the advertisement as intended (Ogilvy, 1985); consequently, typeface that fits the purpose and strategy of an advertising campaign can enhance effective communication with target audiences (Bovee & Arens, 1989). Although the importance of typeface is well established, research accounting for the impact of typeface on audiences’ responses in advertising contexts is still limited. This may be due to difficulties in finding theories and frameworks linking the persuasiveness of advertising messages and the dimensions of typeface (McCarthy & Mothersbaugh, 2002). However, few studies on the effect of typeface on audiences’ reaction with respect to persuasion showed that typeface design can affect the recognition level of advertised brands and increase the readability and retention of the advertisements’ content (Childer & Jass, 2002; McCarthy & Mothersbaugh, 2002). Despite the potentially strong effects of typeface in persuasive communication, existing studies have explored a limited range of typeface or have investigated the combined effects of typeface with other visual elements (e.g., Childers & Jass, 2002). For our enhanced understanding of typeface that may play a significant meaningconveying role in advertising, more systematic studies that delve into the semantic association of typeface along with other advertising elements and audiences’ responses to them are needed. Therefore, this study examines whether typeface in advertising enhances or undermines audiences’ responses to advertising via its association to other visual elements. To the researchers’ best knowledge, no studies have explored the sole efficacy of typeface in the context of print advertisement as it relates to audiences’ attitudes toward the advertisement and evaluation of the brand. The findings of this study advance our knowledge about typeface’s meaning-conveying role in advertising and related responses from audiences. Managerially, this study provides advertising practitioners with an empirical knowledge base for making effective decisions regarding advertising design and typeface. Most advertising designs use three elements: space, image, and type (White, 2007). Space deals with emptiness, and the emptiness determines where typeface images are used. Image is any kind of visual used in advertising. Type is described as being part of the broader concept of image. Typography is more than a simple selection of typeface. It is a series of vigorous drawing processes dealing with spacing, form, and layout in written text or a communication message (McCarthy & Mothersbaugh, 2002; White, 2007). According to the dimensions of typeface elements presented by Childer and Jass (2002), the visual form of typeface has several variations based on design elements, such as “line, weight, orientation, and size” (p. 94). By combining different variations of typeface elements, unique type styles may be created (Childer & Jass, 2002). Few studies have explored the theoretical relation between typeface and audience response, however. For example, Tantillo, Di Lorenzo-Aiss, and Mathisen’s study (1995) explored differences in individuals’ affective responses based on dissimilar design dimensions (sans-serif and serif); while this was one of the first attempts to relate individuals’ responses to differences in typeface, it addressed a narrow range of typeface design elements, sans-serif and serif. There have been research efforts to theoretically link design elements and individuals’ responses. Driven by motivation theory (e.g., Berlyne, 1971; Hirschman, 1980), research has suggested that the more elaborate a design is, the higher an individual’s motivation to process the design; in fact, an elaborate design increases the individual’s arousal so that a more elaborate design is usually preferred. From the perception-based theoretical perspective, however, a simple, straightforward design that is harmonious with other visual elements is believed to be preferred over an elaborate design (e.g., Bornstein & D’Agostino, 1992; Van den Bergh & Vrana, 1998). Another line of research has explored why certain design characteristics are more pleasing to audiences than are others and how those characteristics elicit different responses (e.g., Martindale & Moore, 1988; Veryzer, 1999). While these studies offer preliminary insight into the mechanism for design effects, no solid theoretical explanations for the effects of design characteristics or typeface in particular have been provided. Typeface is an important factor relevant to visual presentations, but its impact has not been given much attention in academia (Childer & Jass, 2002). Some scholars insist that typeface gives visual quality to spoken words (Lewis & Walker, 1989). Although it is true that the initial purpose of visuals in advertising is to be seen, typeface does not exist only to be shown as one of an ad’s visual elements, but also to effectively communicate the advertising message, the meaning and feeling of the message, and the tone of voice (White, 2007). As typeface is a visual information delivery system that literally translates spoken words into written words, typeface selection should be an important consideration in advertising (White, 2007). According to studies exploring typeface effect as visual information, the appropriateness of typeface for a specific appliance addresses the semantic characteristics of visual features via its association with written words (Lewis & Walker, 1989). Semantic association is a perceived connotation that individuals form via actual semantic content from text or brand, and visual elements such as shape, color, logo, and typeface are perceived in terms of the semantic association they embody (Van Rompay, Pruyn, & Tieke, 2009). In accordance with this concept, if consumers associate certain fonts with thoughts of elegance, then the brand that the font represents is perceived as being elegant, as well (McCarthy & Mothersbaugh, 2002). Typeface produces semantic associations in two ways. One is that the characteristics of a typeface itself relate to connotations of a brand or product; second, the interaction between the connotation of typeface and the meanings of an ad’s content indicates a semantic association (McCarthy & Mothersbaugh, 2002). In addition, typeface characteristics changes denotative brand claims in connotation. Such implications (generating connotations via typeface) are considered to be a primary factor that forms brand personality by yielding sophisticated “personality-like traits” (Aaker, 1997). Thus, many researchers agree that differentiating the control factors of typeface, such as serifs, tails, line weights, and sizes, can result in variations of semantic associations for brand image (e.g., Bartram, 1982; Rowe, 1982; Walker, Smith, & Livingston, 1986). For example, Rowe (1982) demonstrated that a script typeface is considered elegant, while a non-script typeface is not. Tantillo et al. (1995) found that a serif typeface is considered to be more charming, beautiful, and emotional than non-serif typefaces. Every typeface has characteristics that may either undermine or enhance delivery of a message. Consequently, it is important to select an effective typeface that helps convey the meaning of a message clearly and effectively (Brady, 1988). In fact, the purpose of using an appropriate typeface is to make that typeface fit with a particular object (Biggs, 1954). Studies have shown that typeface choice impacts audiences’ perceived appropriateness of books (e.g., Ovink, 1938), news articles (e.g., Haskins, 1958), and professions (Walker et al., 1986). In advertising and other persuasive communication fields, researchers insist that typeface should be harmonious with the vehicle of the written word and other visual elements in order to elicit a desired affective response (e.g., Biggs, 1954) because typeface carries a message, provides the meaning of the message, implies a tone of voice, and conveys the importance of the advertising, its explanation, and its clarity (White, 2007). Typeface should not be neglected; rather, it is an integral part of an advertising design. If typeface were to be altered or removed, advertisements would cause the audiences to have different mental pictures than those the advertisers intended (White, 2007). When selecting a typeface for advertising a certain product, it is important to make an appropriate choice (Biggs, 1954). Proffenberger and Franken (1923) conducted a study measuring the appropriateness of 29 fonts for 10 different products within two product categories—commodities (e.g., coffee, jewelry, perfume, automobiles, building materials) and abstract qualities (e.g., dignity, economy, luxury, cheapness, strength), concluding that “differing typefaces do vary in appropriateness and that judges are able to ‘feel’ this appropriateness or lack of appropriateness” (p. 328). As many researchers have pointed out, advertising does not yield positive responses from audiences simply because of typeface; other advertising elements should be taken into account along with type appropriateness. Therefore, when choosing typeface, typeface appropriateness should be considered in a way that produces harmonious relationship with the visuals and content in an advertisement (Biggs, 1954). Interestingly, some studies have explored how individuals’ behavioral consequences are related to typeface appropriateness. Lewis and Walker (1989) theorized that word and image (of which font is an example) relevance offers a parallel route to content meaning and demonstrated empirical evidence with multiple studies. For example, in their first experiment, when they matched the word heavy to a connotatively heavy font, subjects’ response time was faster than when they matched the same word to a connotatively light font style. In another study, they measured subjects’ response time as it related to image congruence. For instance, when an image of a tortoise was matched to the word slow, the participants’ response time was faster than when the same image was matched with the word fast. (As an analogy, a cheetah was considered congruent with the word fast.) In another experiment, names of animals and typefaces that show connotations of the animals’ characteristics were matched in either congruent or incongruent manner and then the pairings were assessed for the subjects’ actual perception of congruence or incongruence. The findings of this experiment demonstrated how a consonant pairing between typeface and word based on their connotative meanings facilitates individuals’ processing of the information (Lewis & Walker, 1989). H: Individuals exposed to an advertisement that includes typeface that is congruent with the message will show (H1) a more favorable attitude toward the advertisement and (H2) a more favorable attitude toward the brand than will those exposed to an advertisement containing typeface that is incongruent with the message. To test the proposed hypothesis, this study employed a 2 (font type) x 2 (copy type) between-subjects, posttest-only, experimental design. The typeface factor was manipulated at two levels: solid and soft fonts. The solid font was defined as the typeface that held the design descriptors of cold/unemotional/calm/strong/formal/masculine, whereas the soft font represented the design descriptors of warm/emotional/notcalm/delicate/informal/feminine. The advertising copy factor was also manipulated at two levels, representing the same characteristics of either typeface. The participants’ product involvement level was measured as a covariate and controlled for. Prior to the main experiment, several pretests were conducted to identify the appropriate product category, advertising copies, and typefaces. Product Selection. The primary considerations, when selecting a proper product category for the current study, were the participants’ product involvement and knowledge. The cell phone was selected on the basis of its familiarity and its high level of involvement among the participants, college students, and the neutrality of the feelings associated with product so that those intended characteristics would be manipulated for the typeface and ad copy factors. Brand Name. A fictitious brand name was used to avoid any possible familiarity effect of a well-known brand. In addition, the brand name should be neutral and should not cause participants to lean toward to any descriptors of either “soft” or “solid” feelings. A brand name, Merin, was borrowed from a previous study in which it was selected through an elaborate procedure (Childers & Jass, 2002). Ad Copy. Following Childers and Jass’ approach (2002), two types of ad copy employing one supporting claim that presents the product’s single benefit were created. In generating the ad copies, copies from real cellular phone ads were collected and revamped. Consistent with the intended manipulations, one ad copy used a solid-representative tone and the other kept a soft-representative tone. With a panel of 30 undergraduates who were similar to the participants for the main experiment in demographics, the propensity of ad claim and congruence between the product and ad copies was measured. Regarding supportiveness of the ad claim, a seven-point Likert item (strongly disagree/strongly agree) was used to test whether the ad claim supported the feature of the product. It was tested by one-sample t-test with a testing value of 4, with the result showing statistical significance on supportiveness of both ad claims (tsoft = 2.562, df = 29, p < .05 and tsolid = 3.261, df = 29, p < .05, respectively). According to the results, both solid representative match and soft representative match between ad copy and product were statistically significant (tsolid = 5.856, df = 29, p < .05; tsoft = 4.809, df = 29, p < .05), indicating that product image and ad claims were appropriate for solid and soft representative matches. Appropriate Typeface. In relation to selecting appropriate typefaces for the features of ad content and product category, this study used some of the dimensions suggested by Henderson, Giese and Cote’s study (2004). They proposed 12 dimensions of impression responses driven from characteristics of typeface and used six dimensions that can represent the features of both solid/soft ad copies: warm/cold, emotional/unemotional, formal/informal, feminine/masculine, strong/delicate, and calm/not calm. After that, typefaces that represented these dimensions of impression were selected based on previous typeface design studies (e.g. Biegeleisen, 1982; Biggs, 1954; White, 2007). One notable consideration was that while a huge number of typefaces have appeared since the 1990s due to the computer-mediated working environment, previous studies have not covered sufficient styles of typefaces. Therefore, for this study, 25 soft-representative fonts and 37 solid-representative fonts were initially chosen based on graphic metaphors of typeface including sans serif/serif, condensed/extended, bar/arm, shoulder/ear, apex/tail, symmetric /asymmetric, and ascenders/descenders that distinguish and determine the unique characteristics of typeface (e.g., Biegeleisen, 1982; Henderson, Giese, & Cote, 2002; White, 2007). Of the 62 typefaces (25 for soft and 37 for solid), 6 for each category were chosen by three professional graphic designers who currently work at ad agencies. They rated these 12 typefaces on seven-point semantic differential scales representing the same dimensions used for ad copies selection procedure; consequently, six typefaces for each ad copy (solid/soft) were chosen. Then, each of the two ads created through the previous procedure was combined with 6 corresponding typefaces so that a total of 12 ads were exposed to another group of 29 participants, who were also similar in demographics to those of the main experiment sample, in order to obtain an understanding of what prospective typefaces may be congruent with the selected product with the previously crafted ad copies. For each category (solid/soft), the six ad copy x typeface combinations were rated on a scale from 0 (entirely inappropriate) to 100 (entirely appropriate). By comparing the mean scores for the six ads for each dimension, two typefaces were selected as the best matches between product with congruent copy and typeface. The Castellar typeface was chosen for the solid representative typeface (M = 63.93, SD = 2.88), while the Monotype Corsiva typeface was selected for the soft representative typeface (M = 6.57, SD = 2.55). Stimulus Advertisements. Based on the pretest’s results, one brand name (‘Merin’), one product (cell phone), and two appropriate ad claims with two typefaces congruent with those ad claims were chosen. 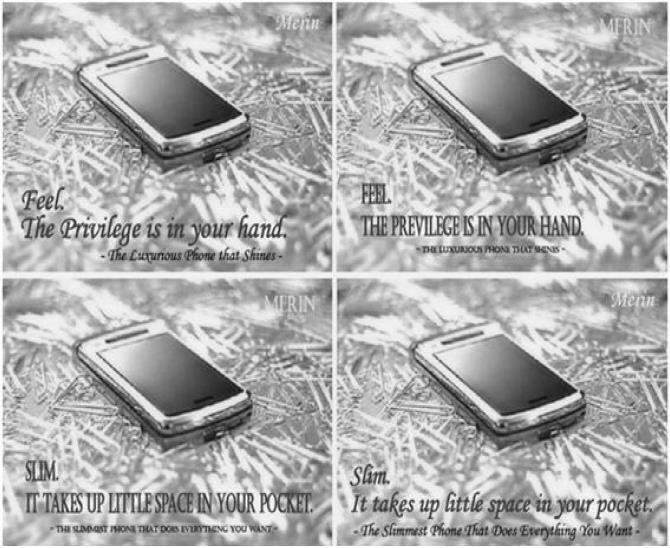 Consequently, four advertisements for the cell phone, Merin, were generated as the final stimuli of the study as follows by mix-matching the soft- and solidrepresentative typefaces: (1) soft copy and soft font (Monotype Corsiva), (2) soft copy and solid font (Castellar), (3) solid copy and solid font (Castellar), and (4) solid copy and soft font (Monotype Corsiva). See Figure 1. Figure 1. Experimental Stimuli (From top left to right: congruent ad and incongruent ad in the soft match condition; from bottom left to right: congruent ad and incongruent ad in the solid match condition). Dependent Measures. Participants were asked to indicate their attitude toward the advertisement using a seven-point, semantic differential scale that included four items anchored by “unlikable/likeable,” “bad/good,” “negative/positive,” and “unfavorable/favorable” (α = .94). Attitude toward the brand was measured on a seven-point, semantic differential scale consisting of five items anchored by “bad/good,” “unfavorable/favorable,” “negative/positive,” “ineffective/effective,” and “of bad quality/of good quality” (α = .93). Covariate. Level of involvement with the advertised product was considered to be a covariate in this study. Level of involvement is defined as how important an individual feels the advertised product is to himself or herself. According to a study by Petty and Cacioppo (1983), individuals highly involved in a certain product are more attracted to advertisements promoting the product than are those with low involvement. Thus, participants’ levels of involvement relating to advertised products had to be controlled for. This covariate was measured on a seven-point semantic differential scale asking how important the advertised product was to participants, and it included three descriptors: “nonessential/essential,” “not beneficial/beneficial,” and “not needed/needed” (α = .93). Manipulation Check. Manipulation for typeface appropriateness to ad copy was measured via an ad component relevance scale (Peracchio & Meyer-Levy, 1997). The scale was initially designed to assess the relevance between copy and picture in an ad and was modified for this study to measure congruence between products with appropriate ad copy and typeface. Participants were asked to indicate their answers on a seven point, semantic differential scale with the endpoints of “was not” and “was,” and “did not” and “did.” The statements were “The design descriptions of font used in the ad __________ relevant to the ad copy and picture,” “The ad copy and picture __________ relevant to the design descriptions of font used in the ad,” “The design descriptions of font, copy and picture used in the ad __________ contain the congruency,” and “The design descriptions of font __________ pertinent to the ad copy and picture” (α = .92). A total of 110 college students (58 female, age M = 20.7) from a large Southeastern university in the U.S. participated in the study in exchange for research credit. The majority of the participants were Caucasians (62.7%, N = 69), followed by Asian Americans (16.4%, N = 18). The remainder of the sample consisted of Hispanics (12.7%, N = 14), African Americans (4.5%, N = 5), and multicultural participants (1.8%, N = 2). The experiment was administered online. Participants were randomly assigned to one of the four experimental conditions, all of which included a front page, an experimental advertisement, and a questionnaire. The front page explained that the purpose of the experiment was to examine whether typeface undermines or enhances audiences’ responses to advertising via its association to other visual elements in the advertisement. The stimulus advertisement was posted on the screen while the participants filled out the questionnaire, which included covariate measures, dependent measures, manipulation check measures, and demographic information. Upon completing the session, participants were debriefed and dismissed. Two separate analyses of variance (ANOVA) tests for participants’ evaluation of ad copy-typeface congruence were performed. More precisely, the appropriateness of the typeface to the copy was assessed since the focus of this study was to understand the role of typeface in enhancing the intended advertising message. The results revealed significant mean differences between copy-typeface congruence and copy-typeface incongruence for both soft and solid matches. More specifically, the Monotype Corsiva font (M = 4.62) was perceived as significantly more congruent with the ad copy than was the Castellar font (M = 3.38) in the soft condition (F(1, 63) = 9.73; p <.05). Thus, the manipulation of congruency between ad copy and typeface was successful. A series of multivariate analysis of covariance (MANCOVA) tests was conducted to examine the hypotheses predicting that typeface appropriateness would positively influence 1) attitude toward the advertisement [Aad] and 2) attitude toward the brand [Ab]. Two sets of MANCOVA tests were performed, one for the soft match (congruence vs.incongruence) and the other for the solid match. In these MANCOVA tests, the two dependent variables were assumed to be conceptually related to each other rather than independent of one another, and the high Pearson’s correlation coefficients indicated the empirical relationship between these variables (rsoft condition = .53, p < .001 and rsolid condition = .71, p < .001, respectively). While controlling for the covariate, product involvement, the results ensured that the effect of typeface appropriateness on the dependent variables was statistically significant for both soft match (F(2, 41) = 5.68, Wilk’s Lambda = .78, p < .05) and solid match (F(2, 61) = 5.51, Wilk’s Lambda = .85, p < .05). Univariate analyses of covariance (ANCOVAs) were then performed to assess the effects of typeface on each of the dependent measures. As predicted in H1, in the soft match condition, participants showed a significantly more favorable attitude toward the ad when the ad components (ad copy-typeface) were congruent (Msoft-soft = 4.89 verses M soft-solid = 3.71; F(1, 42) = 9.18; p <.05), and the same result was found for the solid match condition (M solid-solid = 4.20 verses Msolid-soft = 3.30; F(1, 62) = 11.16; p <.05). Consistent with the prediction of the second hypothesis, a significant effect of typeface appropriateness on attitude toward the brand was detected for both soft match (Msoft-soft = 4.90 verses Msoft-solid = 4.08; F(1, 42) = 5.73; p <.05) and solid match (Msolid-solid = 4.46 verses Msolid-soft = 3.81; F(1, 62) = 4.95; p <.05); participants had less favorable attitudes toward the brand when the typeface was not congruent with what was said in the advertisement. The purpose of this study was to examine whether typeface undermines or enhances audiences’ responses to advertising via its association with other visual elements in an advertisement. So far, studies dealing with symbolic meanings in advertising have mostly explored the effects of the semantic association of all visual elements on viewers’ advertisement and brand evaluations in combination; however, the current study focused on typeface as a meaning-conveying vehicle and examined its role of symbolic representation in determining advertising audiences’ responses. As anticipated, it was found that individuals who perceived that ad components were congruent showed more favorable attitudes toward the ad and the advertised brand. That is, the suitability of typeface for a particular product, in conjunction with a congruent message, can generate a positive impact on the advertising audiences. This result was consistent with previous typeface studies in advertising which suggest that typeface has great potential to increase advertising effectiveness as an important executional cue (e.g., Bovee & Arens, 1989; McCarthy & Mothersbaugh, 2002). In addition to solidifying the findings of prior research, the present study also breaks new ground. Although few studies have explored the theoretical relation between typeface and audiences’ response, most of them stand on this relatively fragile linkage. By employing a pure design and visual communication perspective, this study ensures that these perspectives can be employed in an applied field of study, such as advertising and marketing. Moreover, this study advances our knowledge about audience’s responses to typeface’s meaning-conveying function. Typeface has been considered as the visual quality of spoken words (Lewis & Walker, 1989). However, although it is true that the initial purpose of visuals in advertising is just to be seen, typeface does not exist only to be displayed as one of the visual elements, but also to explain the ad message, the meaning of the message, the tone of voice, the feeling of the message, and the importance of the advertising. Therefore, appropriate typeface treatments also have an aspect of effective advertising in relation to the message, audience, and medium (White, 2007) and they generate various affective responses, as typeface is influenced by the message, medium, audience, and purpose of the advertisement. Central to the findings of this study was congruence effects. When an advertisement’s message, image, and typeface posit the same connotation, the ad should bring an intended response from the audience. This means that that a consonant matching between typeface and its connotative meaning to message and image can influence individuals’ responses and attitudes. The findings also contribute to the development of knowledge within an advertising context. Empirical evidence was found that typeface generates various affective responses, suggesting that it should not be neglected. As it is an integral part of advertising design, if typeface were to be altered or removed, advertisements would cause audiences to have different mental pictures than what the advertisers intended (White, 2007). Therefore, advertising practitioners who are in charge of advertising campaigns should not choose typefaces based on intuition; rather, they should try to select a typeface based on empirically supported rationales. To do this, directors in the creative design community need to know how to conduct systematic research in order to better understand how different typefaces affect audience impressions. These contributions notwithstanding, the study has limitations that could be addressed in future research. The generalizability of this study’s findings is limited because of the student sample employed as subjects. Audiences might perceive advertising components differently depending on their age, gender, cultural background, or other variables. Thus, a general population sample might have led to different results. Therefore, further research on this topic should first consider individual differences on attentiveness to font aesthetics. Since little research indicates that perceptions of font aesthetics differ across individuals (e.g., Bloch, Brunel, & Arnold, 2003), countries (e.g., Pan & Schmitt, 1996), or gender (e.g., Doyle & Bottomley, 2004), a study exploring the extent to which responses to typeface and other designed stimuli vary across consumers would be valuable. Future research could also include more diverse measures to tap audiences’ response to typeface in advertising. Along the line of the Dual-Mediation Hypothesis (DMH), many scholars employ attitude toward the ad, attitude toward the brand, and purchase intention together to assess advertising effectiveness (MacKenzie, Luts, & Belch, 1986). However, for the current study, attitudinal dimensions of audience response to advertising were gauged. More refined measures of cognitive, affective, and behavioral responses to typeface, both quantitative and qualitative, would deepen our knowledge in this area. Another avenue of research would be a comparison of groups, such as professional graphic designers or art directors, who are in charge of selecting typeface in practice, with general audiences, to gain a sense of their sensitivity regarding typeface when they evaluate advertising. If there is a perceptual gap between design experts and lay audiences in evaluating typefaces, then leaving typeface decision making to design experts, which is the typical way that advertising is done in the real world, would be a questionable practice. Hence, such research can help advertisers to better understand the profitability of typeface in advertising by providing insight into typeface, which may differ from the perceptions of design experts. Finally, typeface effects might vary with media and exploring similarities and differences of typeface effects between the traditional print media environment and the online environment would be interesting. With the advent of online advertising, the application of imperative findings from traditional media to relatively newer media has been pursued. By the same token, a comparison of two-dimensional vs. three-dimensional interfaces, reflecting the evolving media technology, may broaden the insights into the effects of typeface. 1.Aaker, J. L. (1997). Dimensions of brand personality. Journal of Marketing Research, 34 (3), 347-356. 2.Bartram, D. (1982). The perception of semantic quality in type: Differences between designers and non-designers. Information Design Journal, 3(1), 38-50. 3.Berlyne, D. E. (1971). Aesthetics and psychobiology. New York: Meredith Corporation. 4.Biegeleisen, J. I. (1982). Handbook of typefaces and lettering (4th ed.). NY: Arco Publishing, Inc.
5.Biggs, J. R. (1954). The use of type. London, UK: Blandford Press. 6.Bloch, P. H., Brunel, F. F., & Arnold, T. J. (2003). Individual differences in the centrality of visual product aesthetics: Concept and measurement. Journal of Consumer Research, 29(4), 551-565. 7.Bornstein, R. F., & D'Agostino, P. R. (1992). Stimulus recognition and the mere exposure effect. Journal of Personality and Social Psychology, 63(4), 545–52. 8.Bovee, C. L., & Arens, W. F. (1989). Contemporary advertising (3rd ed.). IL: Richard D. Irwin Inc.
9.Brady, P. (1988). Using type right. Cincinnati, OH: North Light Books. 10.Childers, T. L., & Jass, J. (2002). All dressed up with something to say: Effects of typeface semantic associations on brand perceptions and consumer memory. Journal of Consumer Psychology, 12(2), 93-106. 11.Craig, J. (1980). Designing with type: A basic course in typography. New York: Watson-Guptill Publications. 12.Doyle, J. R., & Bottomley, P. A. (2004). Font appropriateness and brand choice. Journal of Business Research, 57(8), 873-880. 13.Haskins, J. B. (1958). Testing the suitability of typefaces for editorial subjectmatter. Journal of Quarterly, 35, 186-194. 14.Henderson, P. W., Giese, J. L., & Cote, J. A. (2004). Impression management using typeface design. Journal of Marketing, 68(4), 60-72. 15.Hirschman, E. C. (1980). Innovativeness, novelty seeking, and consumer creativity. Journal of Consumer Research, 7(3), 283–95. 16.Lee, A. Y., & Labroo, A. A. (2004). The effect of conceptual and perceptual fluency on brand evaluation. Journal of Marketing Research, 41(2), 151-165. 17.Lewis, C., & Walker, P. (1989). Typographic influences on reading. British Journal of Psychology, 80, 241-257. 18.Martindale, C., & Moore, K. (1988). Priming, prototypicality, and preference. Journal of Experimental Psychology: Human Perception and Performa-nce, 14(4), 661–70. 19.McCarthy, M. S., & Mothersbaugh, D. L. (2002). Effects of typographic factors in advertising-based persuasion: A general model and initial empirical tests. Psychology and Marketing, 19(7-8), 663-391. 20.MacKenzie, S. B., Luts, R. J., & Belch, G. E. (1986). The role of attitude toward the ad as a mediator of advertising effectiveness: A test of competing explanations. Journal of Marketing Research, 23(2), 130-43. 21.Ogilvy, D. (1985). Ogilvy on Advertising. NY: Random House, Inc.
22.Ovink, G. W. (1983). Legibility, atmosphere and forms of printing types. Leiden: Sijthoff. 23.Pan, Y., & Schmitt, B. H. (1996). Language and brand attitude: Impact of script and sound matching in Chinese and English. Journal of Consumer Psychology, 5(3), 263-277. 24.Peracchio, L. A., & Meyer-Levy, J. (1997). Evaluating persuasion-enhancing techniques from a resource-matching perspective. Journal of Consumer Research, 24(2), 178-191. 25.Petty, R. E., & Cacioppo, J. T. (1986). Communication and persuasion: Central and peripheral routes to attitude change. New York: Springer-Verlag. 26.Proffenberger, A. T., & Franken, R. B. (1923). A study of the appropriateness of type faces. Journal of Applied Psychology, 7(3), 12 – 27. 27.Reber, R., Schwarz, N., & Winkielman, P. (2004). Processing fluency and aesthetic pleasure: Is beauty in the perceiver's processing experience? Personality and Social Psychology Review, 8(4), 364-382. 28.Rowe, C. L. (1982). The connotative dimensions of selected display typefaces. Information Design Journal, 3(1), 30-37. 29.Somerick, N. M. (2000). Practical strategies for avoiding problems in graphic communication. Public Relations Quarterly, 45(3), 32-34. 30.Tantillo, J., DiLorenzo-Aiss, J., & Mathisen, R. E. (1995). Quantifying perceived differences in type styles: An exploratory study. Psychology & Marketing, 12(5), 447–57. 31.Van den Bergh, O., & Vrana, S. R. (1998). Repetition and boredom in a perceptual fluency/attributional model of affective judgment. Cognition and Emotion, 12(4), 533–53. 32.Van Rompay, T. J. L., Pruyn, A. T. H., & Tieke, P. (2009). Symbolic meaning integration in design and its influence on product and brand evaluation. International Journal of Design, 3(2), 19 – 26. 33.Veryzer, R. W. (1999). A nonconscious processing explanation of consumer response to product design. Psychology & Marketing, 16(6), 497–522. 34.Walker, P., Smith, S., & Livingston, A. (1986). Predicting the appropriateness of a typeface on the basis of its multi-modal features. Information Design Journal, 5(1), 29-42. 35.White, A. W. (2007). Advertising design and typography. New York: Allworth Press.